Our elephant trekking experience in Phuket. We had our own dedicated taxi to take us to go elephant riding and to experience the 9D images at the Trickeye museum. We met our taxi driver in Bangla road, who also waved his laminated brochures to passing Bangla road crowds. After agreeing on the cost of our trip the next day and giving our hotel details, we parted ways. The next morning, at exactly 11h00, our soft-spoken taxi driver was there to chauffeur us to our planned attractions. Our driver lives about five hours from Patong, where he works. He would go home some weekends or his family would join him in Patong. 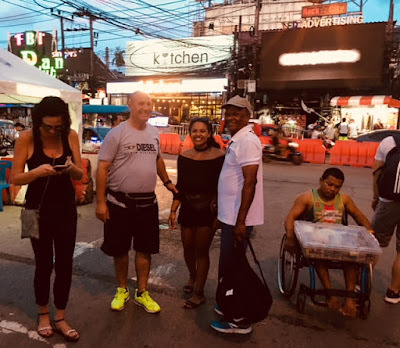 The day we met him in Bangla road, his young son was with him but since we were three passengers, the little one had to stay at home. 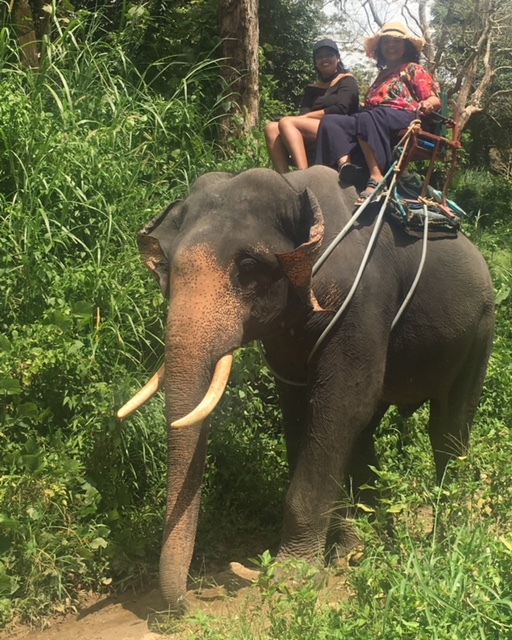 Our first stop was to do the elephant rides. Here again, you will experience the ingenuity of the Thai people. Once you had paid for your ride, you are invited to buy food for your elephant. The food is a tiny plastic bowl of small overripe bananas that will set you back 100 baht. We bought one bowl in the spirit of feeding our majestic animal for taking us on her back. The track we followed slopes uphill and winds up towarsd the forest section ahead. You only become aware of the sheer size of an elephant when you sit perched high above the ground. Our elephant walked slowly, nibbling on the grass and twigs on the side of the path and also slurped the waters that trickled on the edge of the path in certain spots. Sometimes the elephant swayed as it balanced itself on this narrow path, making me feel jittery. 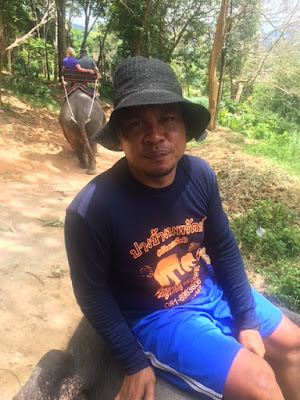 The elephant driver sang some Thai folk song and looked just like a jockey, squatting on the elephant with just his lower legs visible to us. Then, strategically, the elephant is instructed to stand still on an uphill section. At this point our small elephant rider turned to face us and reached out for a small wicker basket filled with bracelets and elephant teeth. Each item costs 300 baht. This sales encounter happens while the elephant is gently stomping backward or forward. 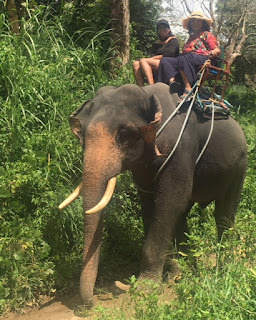 I am sure this is when many a tourist parts with her 300 baht,just to get the elephant moving with the driver in his driving position! A friend said that the bracelet she had purchased fell apart a day later. Returning to camp. Our driver has run ahead to take pictures of us. We politely declined all the offers and coaxing, telling our guide he must come to Africa because we sell beautiful beads like theirs. Our elephant driver gave up and continued up the hill with us. When we turned back, the next sales pitch landed. If you want photos taken by the driver, the cost is 100 baht, with your own phone! Of course, you want pictures so you hand over your camera. The next minute our elephant driver jumped off and started clicking away while our elephant continued walking slowly downhill. Now and then when our downhill trip picked up speed, our elephant driver spoke to the elephant that then slowed down a bit. I visualised myself and Sasha being catapulted into the air by a runaway elephant who was fed up with her human burden. Thankfully, that thought remained just that - an overactive brain taking over! When Basil lost one of his flip flops, his elephant picked it up and gently passed it on to Sasha. We were so enthralled that I forgot to take a picture. I promptly bought another bowl of overripe miniature bananas as a thank you gift for our elephant when we returned to the camp. After we fed her, I bowed and gave a Thai thank you with my hands in the prayer pose. The next minute, our elephant looked me in the eye, lowered her head and trunk and acknowledged my thanks. 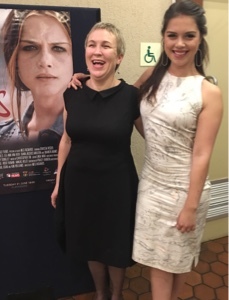 That was surreal! As we turned to leave, I thanked the Queen of the jungle again. "Thanks for the blessings," I said. " Thanks for the ride. You're beautiful. Then I bowed and gave her another Thai thank you. Read about our experience at Trickeye museum in the next post. 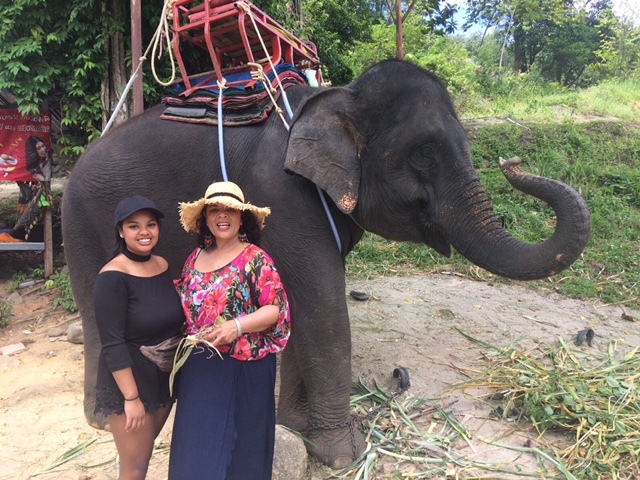 Let me know if you are enjoying these stories about our experience in Thailand's Phuket.